Exotic spices – Allspice, Capers, Cloves, Nutmeg and mix with Crushed Orange, Crisp Pine Needles and just a touch of Patchouli and Vanilla. This fragrance is all about exotic spices – Allspice, Capers, Cloves, Nutmeg and mix with Crushed Orange, Crisp Pine Needles and just a touch of Patchouli and Vanilla to add a deep base note for staying power. Make your shave the best by using only the finest oils & butters to leave y our skin softer than when we meet. This soap is designed with the glide you need every time. This is a Bay Rum in the sense of “Pardon me, would you mind terribly if I boarded your vessel and availed myself of your goods?”. Not, “Arrgh, I be taking ye ship and eating ye heart.” Refined and lovely scent. It was made with real spiced rum. This is a winner for sure. ·Liquid silk – This silk forms a natural layer over the skin, keeping moisture locked in and harsh conditions out, leaving skin protected and well-nourished. 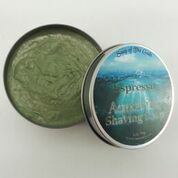 · Bentonite Clay – Gives an extra creaminess and silkiness to the shave soap. Generally, white clay’s natural absorbing, detoxifying and exfoliating properties makes it an indispensable ingredient in shaving products. Made with Aloe Vera, Stearic Acid, Coconut Fatty Acid, Palm Stearic, BTMS, Glycerin, Potassium Hydroxide, Castor-Coconut-Grapeseed-Babassu-Argan, Oils, Extracts, Polyquats, Spiced Rum, Allantoin, Silica, Liquid Silk, Bentonite Clay, Sodium Lactate, and Fragrance. Bay rum at its finest. Incredible lasting scent and wonderful lather. I shave with a straight razor and NO irritating after burn. A must have in your stable. Great Bay Rum Shaving Soap! Love the smell, Bowl lathers easy with our hard water here in Illinois. Plenty of slip with this soap no nicks. Face feels great even hours after the shave. This soap pairs great with the Bay Rum After Shave Splash! Get you some! Bay Rum is awesome, and smells so good. It whips up an incredible amount of lather, I Just absolutely love it, and cannot wait to re-order! Thanks Van yulay.